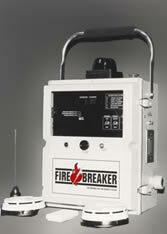 The Fire-Breaker System is the first of its kind: a portable, wireless fire detection system which utilizes battery-powered, smoke detectors and a central receiver/transmitter control unit to constantly monitor a broad site area for fire conditions. When fire conditions are sensed by the remote detectors, the system activates audible and visual alarms as well as an optional dialer, and can also shut down all power to the site electrical equipment, such as air filtration units and heat generating equipment. Simultaneously, the system can energize special power circuits for emergency lighting to facilitate a safe and orderly evacuation of the site. Portable and wireless: The central control unit is easy to carry and set up. FM radio transmissions link this with remote, battery powered smoke detectors placed throughout the site. Multiple mode settings allow central unit a) automatically shut down electrical equipment three minutes after alert is sounded, or b) sound alert and wait for manual response by site personnel. 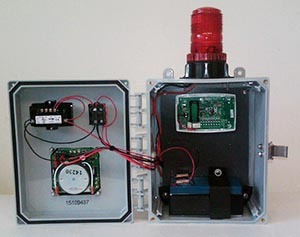 Hand-held battery-powdered “panic-button” transmitter unit allows manual activation. Battery back-up activates system in the event of a power failure (includes charger). Each unit will monitor up to 32 individual detectors covering a total of 2800 sq. ft.